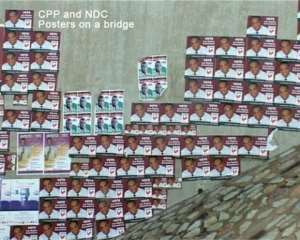 Accra, Nov 18, GNA - Political party activists have been urged to exercise restraint in their speech and to show respect for the opinions of others during the electioneering campaign. Mr Larry Bimi Chairman of the National Commission for Civic Education (NCCE), who made the call on Thursday, said spreading untrue stories and rumours to harm the character or reputation of officials and members of rival parties should be avoided. Speaking in an interview with the Ghana News Agency in Accra, he said concerns expressed by a section of the public about the use of intemperate language and the flouting of the Political Parties Code of Conduct must be enough warning to party leaders that Ghanaians "abhor negative politicking". Mr Bimi, appealed to politicians to be circumspect in their language on political platforms since this was the breeding ground for "the war of empty words" creeping into the electioneering process. He cautioned against "euphoria" at political rallies and the use of words that could not be substantiated and expecting the media to act as "the public relations officers of parties in their reportage. "You must not undress in public and wish that the media will cover your nakedness"
Mr Bimi said the Political Parties Code of Conduct enjoined them and their agents to avoid defamatory, derogatory and insulting attacks on rival parties or individual personalities by any form of communication, written or verbal. Though the code allowed criticism of opponents, it must be based on policies, actions and programmes of rival parties and must be done with decorum and not inflammatory rhetoric or language. Mr Bimi said party leaders should tolerate and respect the right and freedoms of other political parties to disseminate their manifestos without intimidation and violence and to respect the electorate and other members of the society by addressing them in decent, civil and truthful language. Political parties should educate their followers to conduct themselves in a civil and morally acceptable manner and educate the rank and file on the electoral laws, rules and regulations and to avoid gender, ethnic or religious derogatory remarks, he emphasised.